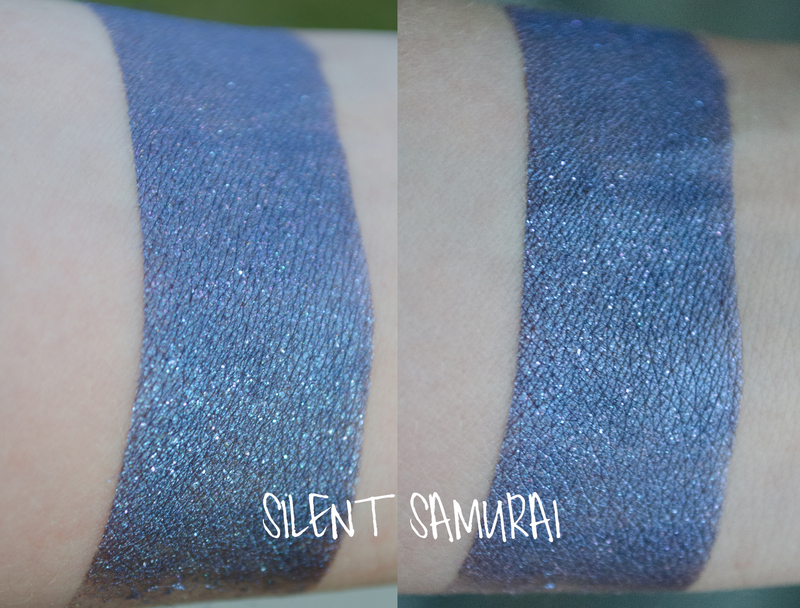 Silent Samurai has a blue base with tons of pink (and maybe some blue?) sparks. I’m not usually a huge blue fan, but holy cow this is so gorgeous! 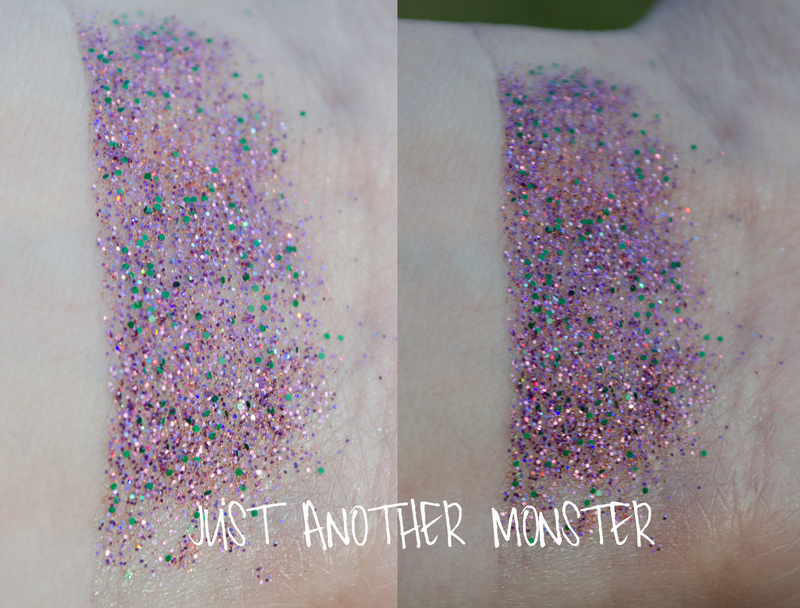 Admittedly, it looked a lot more purple in the jar than it did on my arm, which I was surprised to find. I think it’s because of how prominent the pink sparks show up over the blue base in the jar. I applied it over Darling Girl Glitter Glue, but I think it might need a stronger adhesive like Pixie Epoxy to really pull out the pinks? In any case, this is a really pretty color. 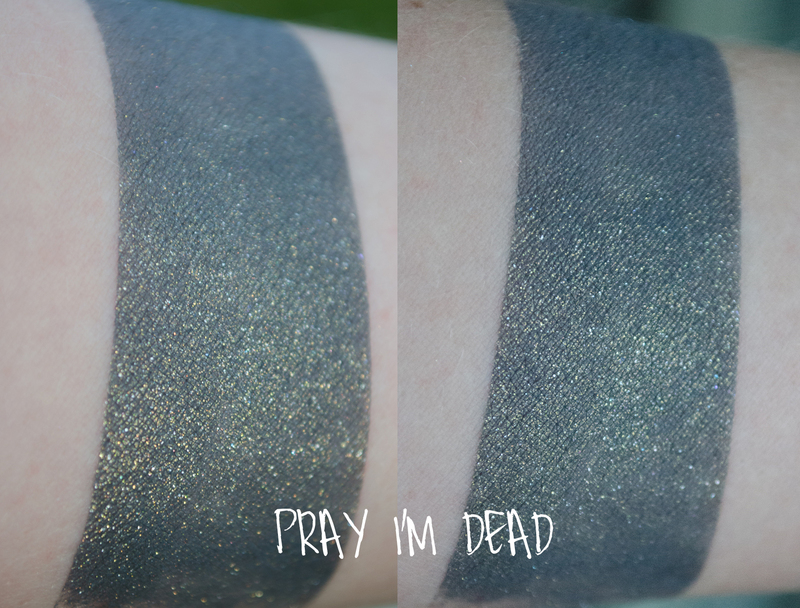 Pray I’m Dead is a charcoal colored shadow with gold/green shine. 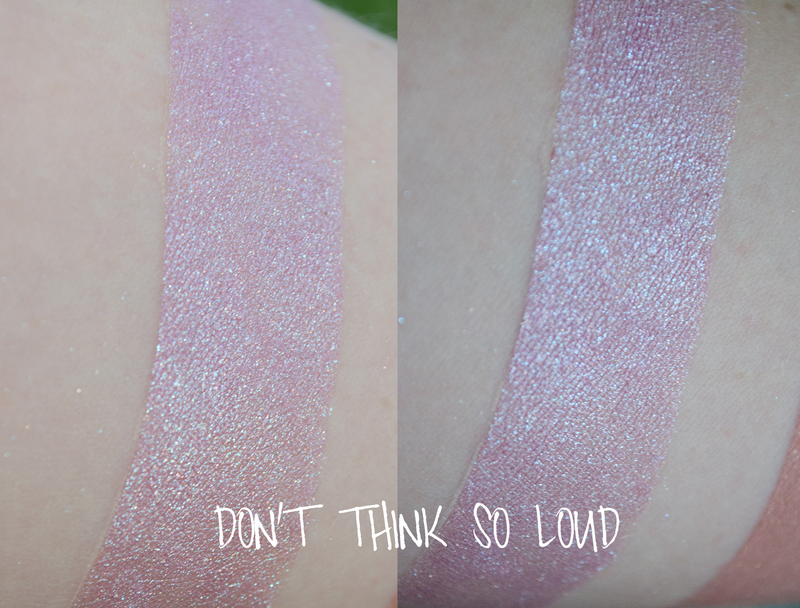 It looks pretty consistent between the swatch and the jar, as you can see. 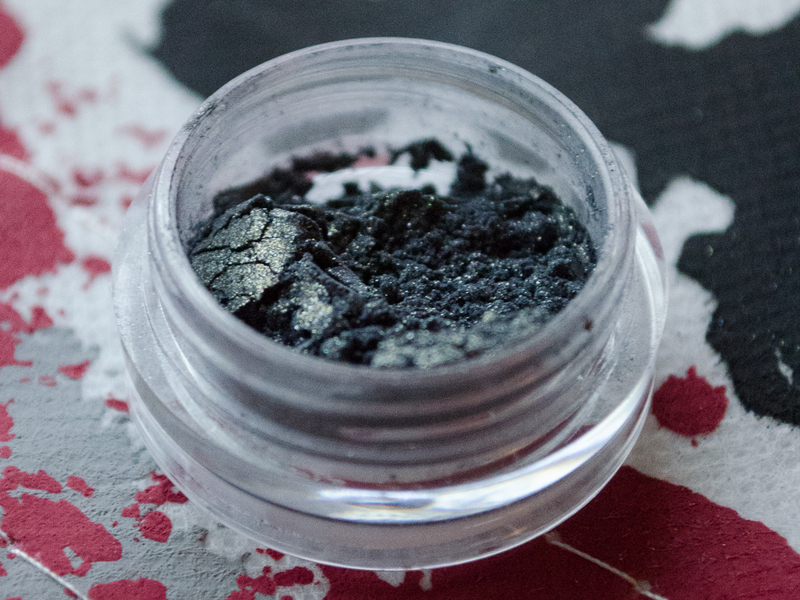 I think this would make one hell of a unique smoky eye! 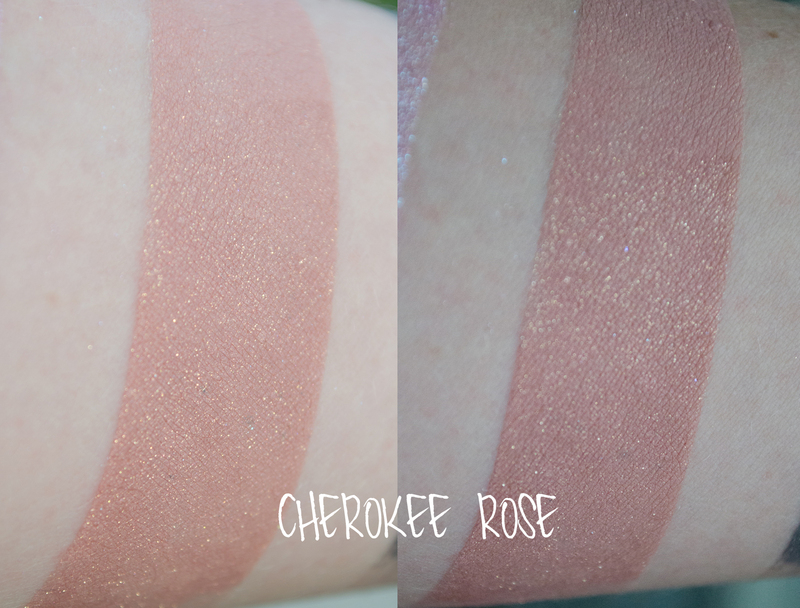 Cherokee Rose is a slightly peachy rose color with champagne sparkles. I actually think this would make a pretty tremendous lip color as well. 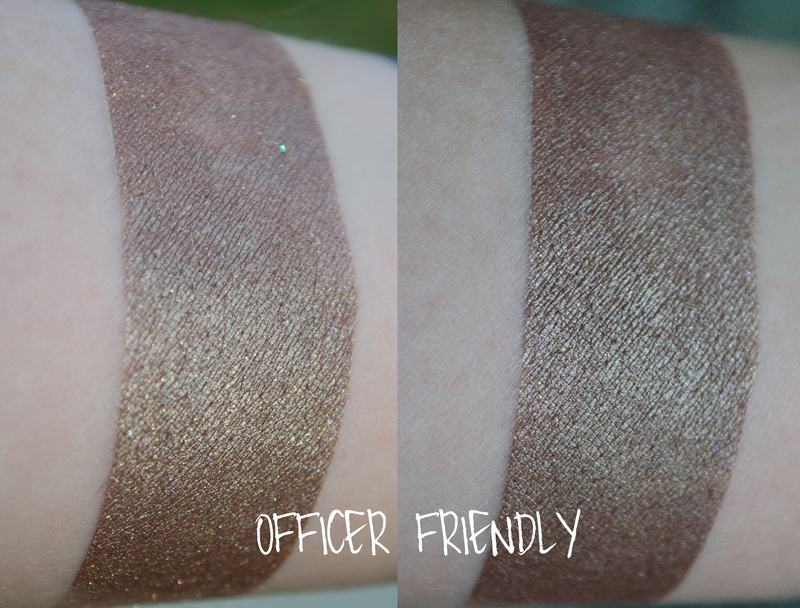 Officer Friendly is my favorite of the bunch! And there is obviously a LOT to like here. 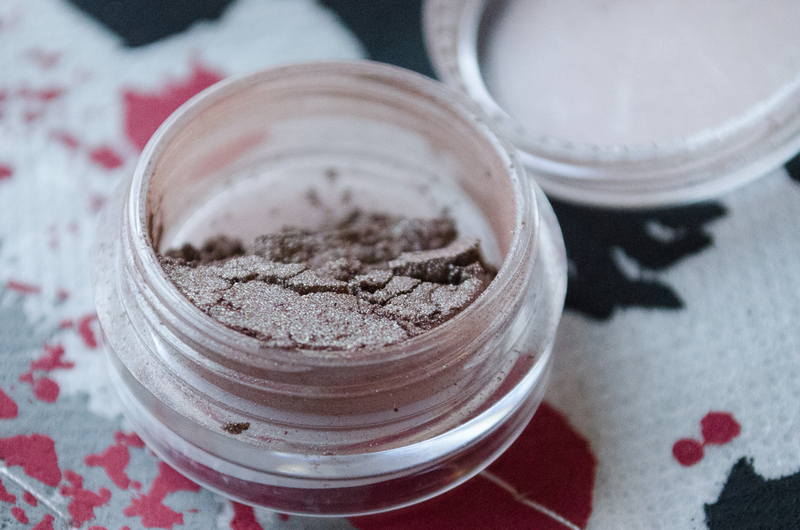 It surprised me when I applied it, because I didn’t expect the brown to be quite as dark… comparing the picture of the swatch and the . It’s a warm brown base (a spot on color for Grimes’ uniform), with some gold/green toned sheen to it. The shift is very cool, I’m excited to use this! Don’t Think So Loud s REALLY pretty! It’s a baby pink with blue/silvery sparks. 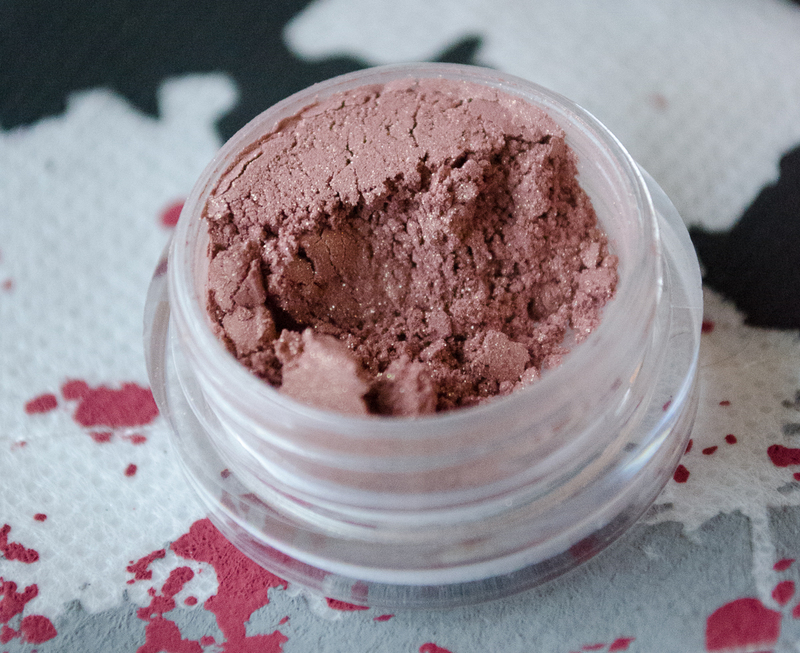 For such a light color, it had excellent pigmentation. 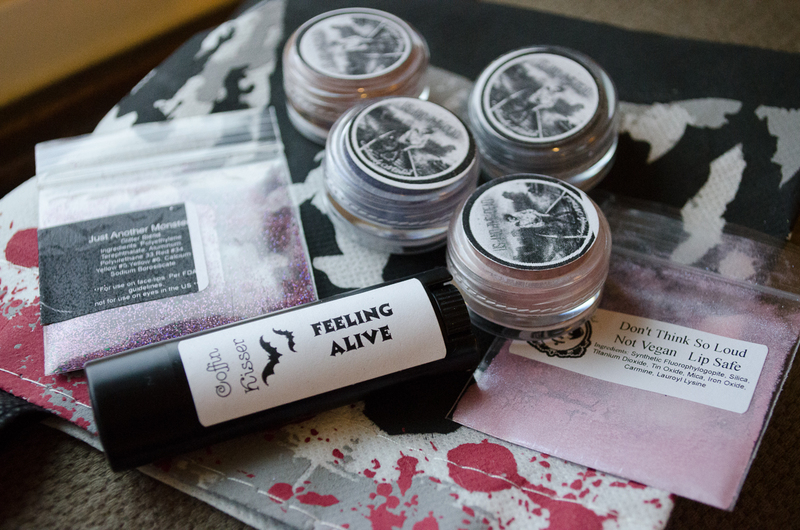 The Cabinet also came with a little baggie of cosmetic glitter, with light pink, dark pink, blue, purple, and green. 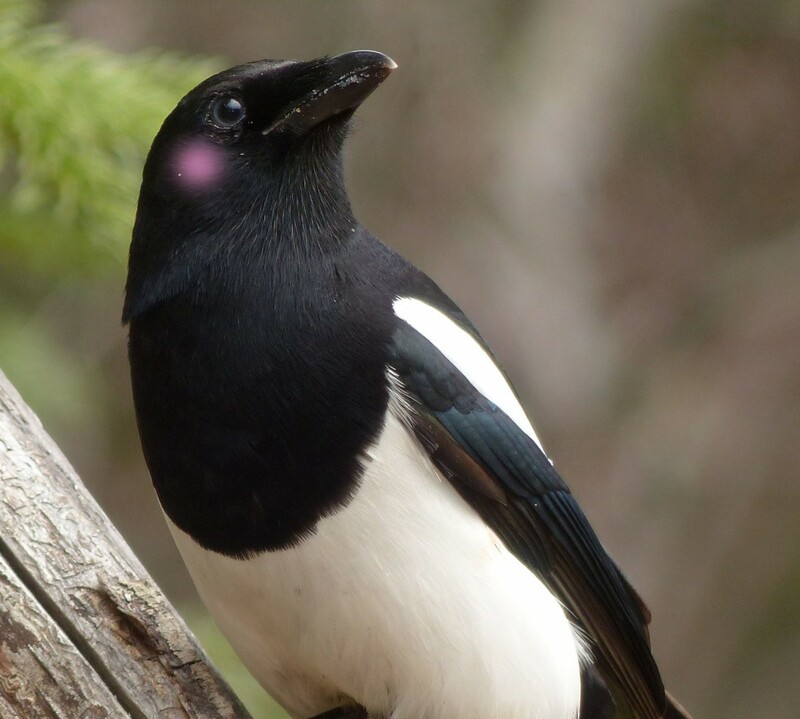 It sort of reminds me of a cupcake with pink frosting and sprinkles. 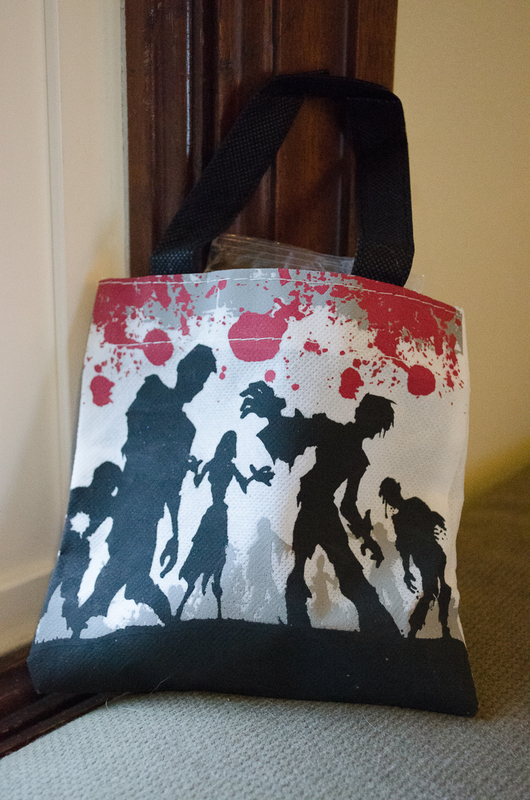 The shadows came with a special little Walking Dead label, super spoopy. EDIT: AW HELL YEAH the flavor is, according to Carrie (owner of Notoriously Morbid) “Georgia Peach Cobbler”! As a person with a distinct lack of hand-eye coordination, I can only imagine this is what a slam dunk feels like? Can I say “boo yah” yet? Did that actually die with the 90’s? 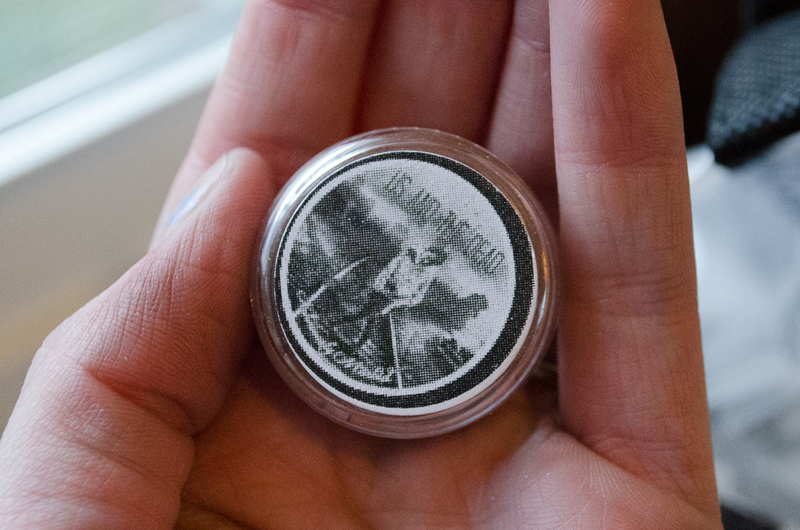 Because I have a monthly subscription to the Vanishing Cabinet, I don’t ‘place an order’ at any particular time, so I can’t speak to that for this product. I do find that I tend to get them toward the latter half of the month. I received this about three days after I received the shipping notification, which I know has nothing to do with Notoriously Morbid, but because USPS has been sucking a bit more royally than usual for me recently, this was a pleasant surprise. If you can sign up for the Vanishing Cabinet, I recommend it. 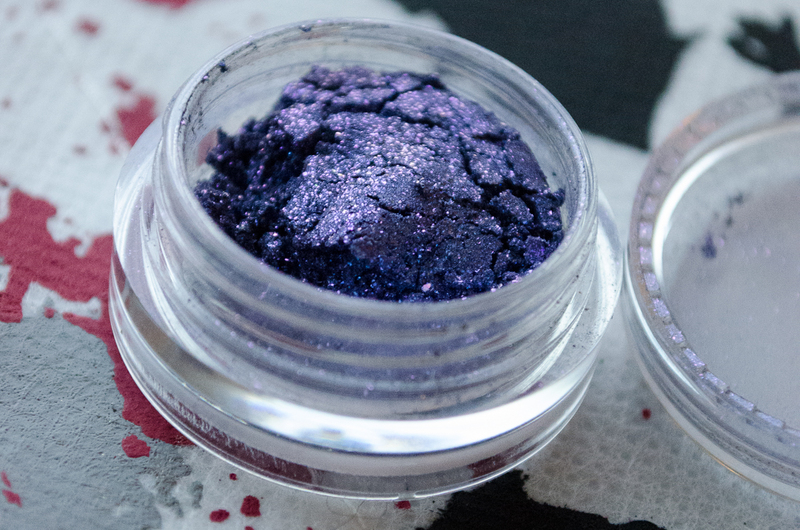 It’s $12.90 with shipping per month, and you get four unique shadow minis, usually two samples, and some sort of a neat extra (like the Coffin Kisser this month, or the lipcraft lip gloss last month). It’s a really well put together little collection each month. It’s like getting a little present, whether you deserve it or not! (Looking at the chocolate bars I’ve demolished this past week, I would say I didn’t deserve it… but I get it anyway, ha ha! ).